St. John’s College is a place where students study the works of history’s greatest thinkers. Founded in 1696 as King William’s School, St. John’s is the third oldest college in the United States. It’s no wonder students in Annapolis and Santa Fe have established traditions that date back decades or longer, from signing the college register during their first day on campus to taking part in senior prank days before graduation. 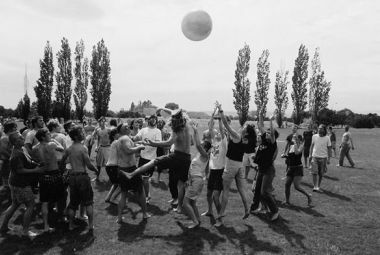 Students, called “Johnnies,” enjoy many of the same activities as their predecessors from years past. 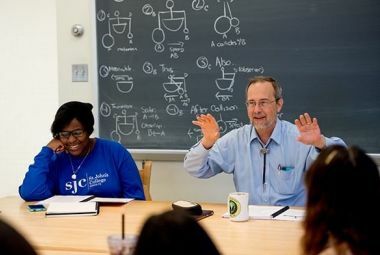 St. John’s faculty members are called “tutors,” who lead classes across the liberal arts curriculum. Instead of serving as content experts or lecturers, tutors guide discussion and act as model learners. 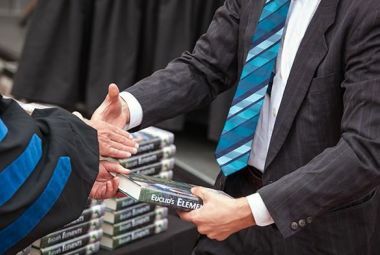 The entire freshman class and new Graduate Institute students are part of Convocation, during which each of them signs the college register, shakes the president’s hand and receives a book to be used in class. A Ptolemy Stone is an ancient device for measuring the angle of the sun compared to the earth, which is the basis for many navigational devices such as the sextant. A Ptolemy Stone is located on both campuses. Both campuses enjoy active Waltz Committees. These dance enthusiasts hold dance lessons and host waltz parties, featuring many different themes. Lessons are held regularly and may include swing, waltz, polka, lindy hop and other styles depending on the time of year. 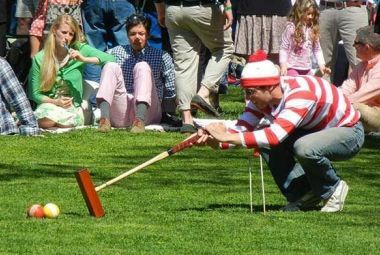 St. John’s hosts the Annapolis Cup, a croquet match against the neighboring Naval Academy held every spring since the 1980s. The match attracts thousands of visitors to the Annapolis campus. The St. John’s team costume is kept a secret until introductions to the match. In Annapolis and Santa Fe, every freshman participates in chorus. The chorus performs at a handful of events throughout the year. Listen to the Freshman Chorus sing "Sicut cervus"
Done since 1937, seminar is an unusual class in that it happens in the evening, and everyone has it at the same time. 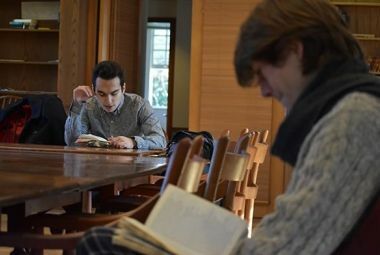 Students may dress up more formally for seminar, and typically students will spill out of class into common areas, where discussion often continues long into the night. 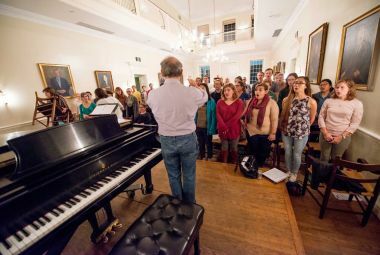 Singing is popular on both campuses, including weekly gatherings of students, faculty and staff to sing “Sicut Cervus,” a song that has become an unofficial anthem of St. John’s. Lectures are given nearly every Friday night on both campuses. 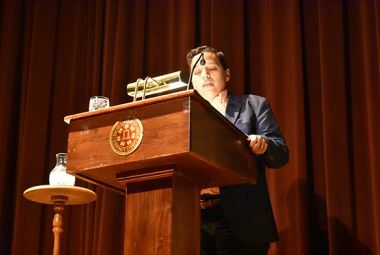 Lectures are given by a mix of faculty members and outside speakers, and the lecture slot is occasionally used for concerts or even plays. A question period follows each lecture. At the end of the year, prizes are awarded to an annual essay from each class (freshman, sophomore, junior and senior) as well as to original translations, original scientific experiments, original poetry, original artwork and original mathematics proofs. At the end of every school year, seniors perform skits, show videos and host an all-day cookout and party on campus. Small, often informally organized seminars on particular works are often held with a small group of students and no tutor, although sometimes a tutor will participate. 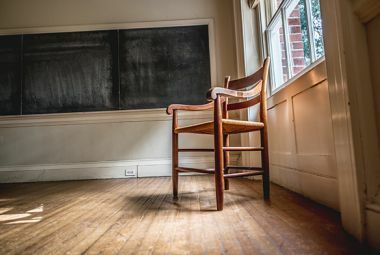 The same wooden chairs are used in all classrooms on each campus. Called the “Johnnie Chair,” each is made by E.A. Clore Sons Inc., a small, family-owned woodworking company in Virginia. 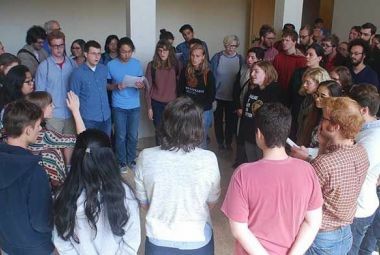 Held each semester on both campuses, Collegium is a chance for students, faculty and staff to perform musical numbers for the St. John’s community. 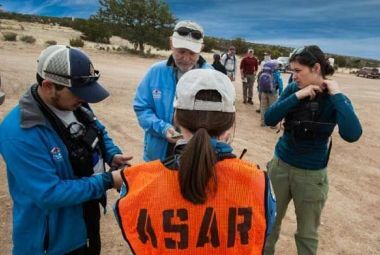 The Santa Fe campus has a search-and-rescue team associated with the Atalaya Search and Rescue team in Santa Fe. Students may join for free, and many do. 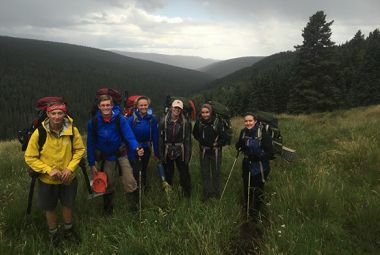 Santa Fe hosts a wilderness orientation program, along with a full-time guide to plan trips for students. Johnnies can enjoy backpacking, rock climbing, canoeing, skiing and snowshoeing, among other activities. Equipment is available for loan (for free) for students. 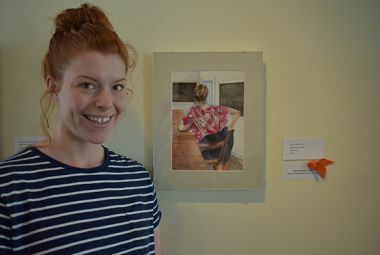 The primary evaluation process at St. John’s, don rags are held near the end of every semester. Students meet with all of their tutors at once for a conversation about the student’s performance. Each member of the senior class must write a lengthy essay on a work or theme of their choosing. 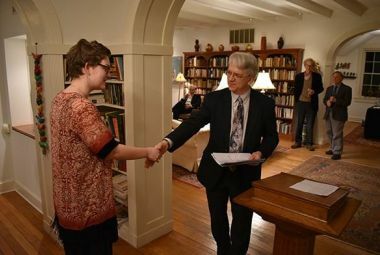 The essays are turned in during a party at the president’s house, after which students return to campus and ring the bell in the bell tower to celebrate the occasion. After seniors have submitted their essays, they each have an oral examination with three members of the faculty using their paper as the foundation. This is a public event; friends, family, peers, coworkers, and even people from town can come and observe this hour-long oral exam. Although the college does not have an official mascot, it does have a few unofficial ones—the most prominent being the axolotl and the platypus. 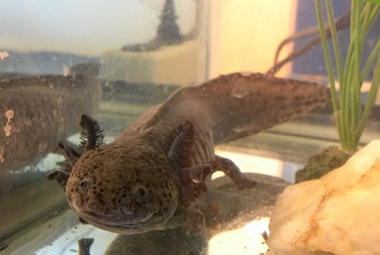 Aside from being one of the college’s unofficial mascots, axolotls live in the laboratories on both campuses, where they are observed in association with some of the readings of freshman lab. 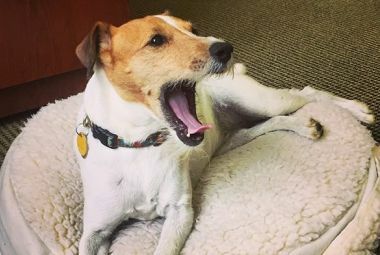 In Annapolis, Arcadia “Cadie” Spector was appointed campus dog in 2006. Campus dog walker is one of the most coveted student jobs! 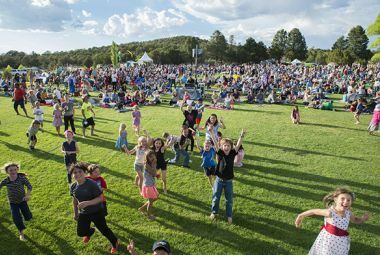 A series of outdoor concerts is hosted on the Santa Fe campus every Wednesday evening during the summer. 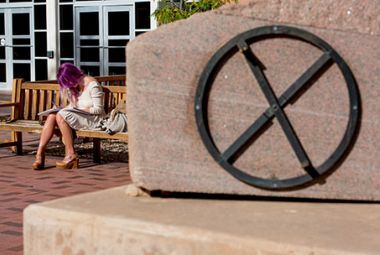 A variety of musical acts perform, and crowds from the college and larger Santa Fe community converge on campus to enjoy. For this tradition, students read aloud either the Odyssey or the Iliad (typically alternating each year) throughout the day, starting in the morning and ending late at night. 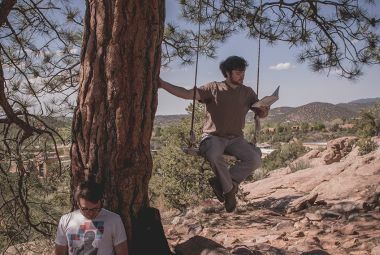 Halfway up Monte Sol on the Santa Fe campus, Johnnies for years have taken in a beautiful view from a wooden swing hung from a tree. A party held the weekend after the last full week of classes each year, Reality features skits, videos, dancing and a general party atmosphere. Sports, including Spartan Madball, also are played. Students in Santa Fe gather at the beginning of the school year for an Ark Party, in which freshman carry the Ark of the Covenant up Monte Sol on the back of campus. 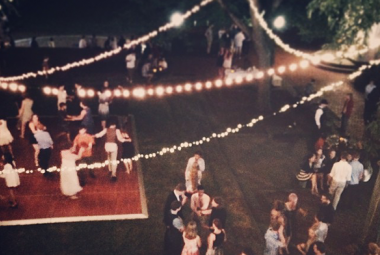 Parties to kick off the school year are held on each campus to welcome freshmen. In Santa Fe, there is the Black and White Ball and in Annapolis is the “Achilles Rager”—a nod to the rage of Achilles in Homer's Iliad. Students, staff and faculty on each campus are assigned to an intramural sports team. 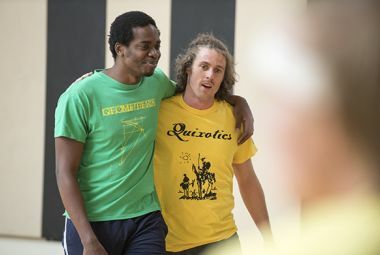 The teams play each other in multiple sports, including Ultimate Frisbee, soccer, basketball, “reasonball,” handball and volleyball. 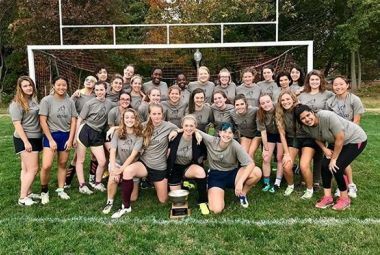 The women’s sports league in Annapolis was founded and named by some of the women of St. John’s. Women can participate in Kunai and intramural sports. Intercollegiate sports have been a tradition at St. John’s off-and-on for more than a century. 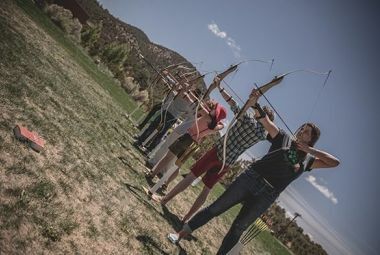 The college now has a handful of intercollegiate teams, from sailing, crew and croquet in Annapolis to archery in Santa Fe to fencing on both campuses. Athletic blazers with the St. John’s seal are awarded to students based on participation and performance. Special blazers are also passed down to one male and one female rising senior each year, as voted on by the intramural and Kunai captains. In addition, one male and female graduating senior are awarded a blazer at commencement for participation, leadership and sportsmanship. A group of two to six students have every class together. Core groups often become good friends and rely on each other for academic support. 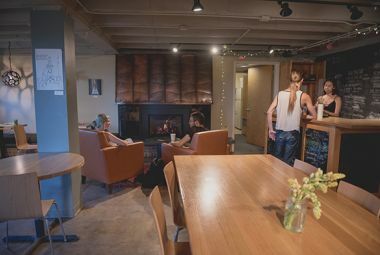 Since 2014, the Cave has served as the student-founded and student-run coffee shop on the Santa Fe campus, providing coffee, snacks and sandwiches, as well as hosting student events, including open mics, film screenings, craft nights, art exhibits and parties. Lola’s is a party held each year with a “casino” theme. 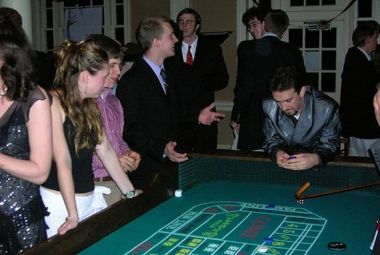 Although there is no gambling with money, students dress in sharp outfits and play games of chance with volunteer dealers. Cotillion is a spring formal hosted by the Waltz Committee after croquet on the Annapolis campus. Traditionally strawberries and cream are served at midnight, and a live band is hired. If the croquet team is victorious, team members typically make a grand entrance with the Annapolis Cup. A formal dinner is held each year for seniors and faculty members, at which the president, dean, faculty and multiple members of the senior class give toasts. A toast traditionally given at the dinner is a “toast to the four republics”—to the Republic of the United States of America, the Republic of St. John’s College, Plato’s Republic and the Republic of Letters. Seniors often perform original music, or pieces that they feel are relevant to their class, for classmates and family before graduation. 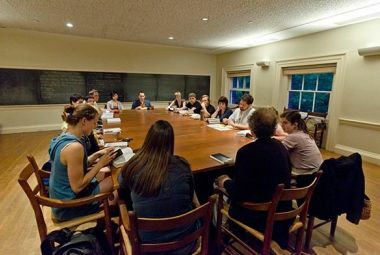 The Student Committee on Instruction (SCI) holds forums throughout the year on academic life at St. John’s, meeting with the faculty Instruction Committee at least once a year. The SCI also hosts the all-college seminar and hosts extracurricular seminar series. During freshman lab, students observe fish as part of their study of biology. 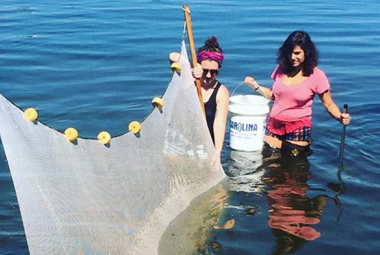 In Annapolis, freshmen often head down to College Creek armed with nets to catch fish for further observation in tanks in the classrooms. 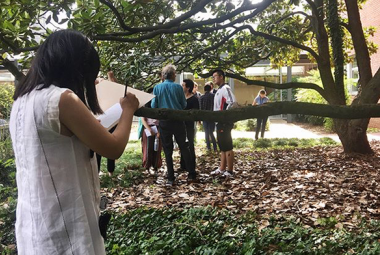 In the fall, members of freshman lab classes are often seen outside taking notes on and making sketches of local flora as part of their study of biology. In Annapolis, it’s the magnolia. In Santa Fe, where it is known as “conifer lab,” students travel to the ski basin and collect various samples, study them, draw them, and come up with a classification system for them. The take-a-tutor-to-lunch program allows students to sign tutors into lunch on campus for free, whether the student is on the meal plan or not. Beyond the formal program, tutors and students will often meet for coffee or lunch off campus. Tutors and seniors in Santa Fe often gather for Nabla, a tradition meant to ease the transition to adulthood and the professional ranks. Reasonball is like flag football with a lot of extra rules, including the fairness rule, which ensures that the losing team is always given possession after a score, no matter which team scores. Players can throw as many forward passes as they can, regardless of their proximity to the line of scrimmage. 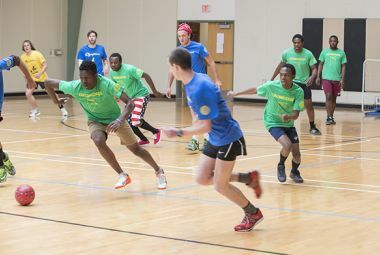 On the Annapolis campus, an intramural draft is held each year in which rising sophomores are drafted to each intramural team. Indoor soccer with a slightly smaller ball, futbalito is played just about daily on the Santa Fe campus, and there is usually at least one tournament each year. 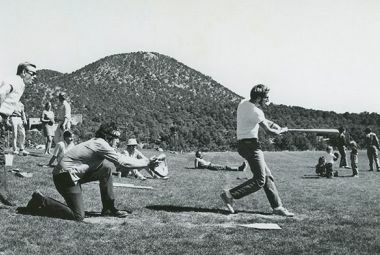 Each spring on the Santa Fe campus, students will challenge other classes to softball games. There is also a faculty/staff vs. student softball game. Spartan Madball is one of the highlights of Reality Weekend. The objective? Simply carry the ball into the other team’s end zone for a point using (nearly) any means necessary, and use your and your teammates’ bodies to stop the other team from carrying it into yours. The first team to score three points wins.